Tracking the fine motor movements of fingers and hands for virtual reality, rehabilitation, ergonomics, biomechanics, and robotics applications can unlock important new breakthroughs in these areas. However, existing technologies have fallen short of achieving precise and complete data for fine motor movement – until now. 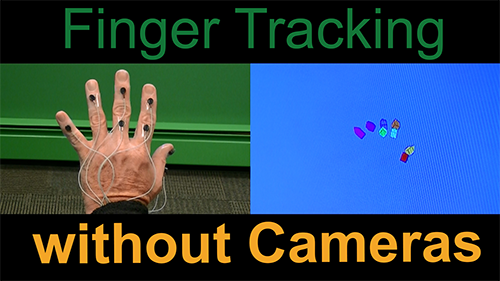 Hand and finger tracking requires far more than that of well-established gross motor motion capture. Although hand and finger tracking is widely studied in biomechanics, borrowing technology from full body tracking, or tracking specific body areas such as shoulder movement or gait analysis, does not deliver optimum results for the finer and more subtle motions of the hands and fingers. A stop-gap solution has been hybrid technology, which can account for missing data as a result of using camera-based technology; but this solution proves cumbersome. Data gloves present another solution; however, gloves can significantly hinder and/or alter finger movement. Participants’ experiences are less organic and fluid. In some glove models, accuracy is compromised by sensors that slip or move within the glove. While reasonably suitable for some VR applications, data gloves simply cannot satisfy the precision measurement needs of biomechanics applications. The full white paper below discusses why the best solution for hand and finger tracking replaces camera-based technology with electromagnetic technology. Without line-of-sight restrictions or latency issues, electromagnetic technology achieves a steady stream of data and obtains full 6DOF (six degrees-of-freedom) measurements. Noraxon USA Inc. has come up with this solution by utilizing both EMG capture and electromagnetic tracking technology to understand the mechanisms that drive finger and hand movements. They have integrated their DTS EMG system with the Polhemus LIBERTY electromagnetic motion tracking system. Polhemus’ small, lightweight Micro Sensors do not hinder natural hand and finger movements, and provide position and orientation tracking with sub-millimeter accuracy.